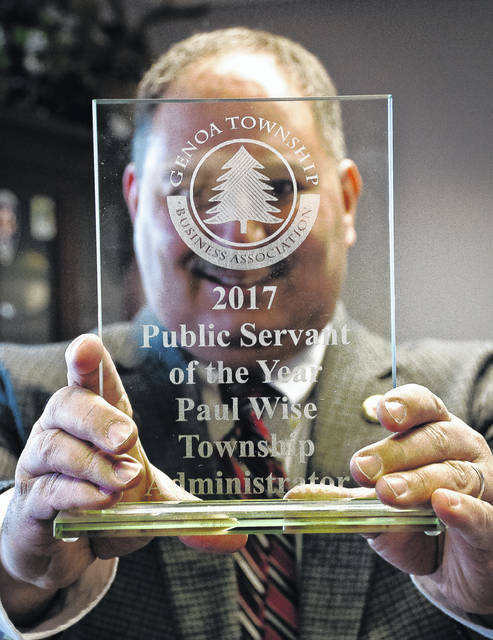 Genoa Township Administrator Paul Wise is the township’s 2017 Public Servant of the Year, awarded by the Genoa Township Business Association. Wise is shown hiding behind the award. Wise was awarded the 2017 Public Servant of the Year from the Genoa Township Business Association. Priebe said in years past, the recipients have been elected officials of the likes of U.S. Rep. Pat Tiberi and State Rep. Rick Carfagna. He said this year the association decided to identify those in the trenches, the people who get things done but go unnoticed. The association picked the perfect person because Wise likes to go unnoticed. Wise moved to Genoa Township in 2004 to become the administrator. He said there were fewer developments and few trails, but now the majority of the township consists of residential neighborhoods, very little business off Maxtown Road and not a lot of commercial properties. “We’re a bedroom community,” he said. Wise said if there is a neighborhood issue, he and the township department heads take care of it. Wise said whether it is building trails or improving roads, it comes down to offering the best services to the residents of the township. This entry was tagged Genoa Township, Paul Wise, Public Servant of the Year. Bookmark the permalink.